It is common for members of the Senate to cite the process of confirming Supreme Court justices as one of their most important responsibilities. These judges receive lifetime appointments and their impact on the law lasts for decades. Senate Judiciary Committee Chairman Chuck Grassley’s continued obstruction of Merrick Garland’s confirmation, though, reveals his lack of respect for his constitutionally mandated responsibility. Previously, Grassley explicitly spelled out his belief that the confirmation process should not be taken as seriously as other functions of the Senate, such as yearly squabbling over budgets and appropriations. “And, of course, I think the Constitution doesn’t elevate the confirmation process quite this high. The Constitution shows this because the ‘advise and consent’ role is spelled out in Chapter 2 with executive powers, and not with the legislative powers in Article 1. So I think the Constitution itself indicates it is not a preeminent legislative power,” Grassley concluded. If the chairman of the Judiciary Committee does not recognize that vetting and voting on the confirmation of Supreme Court justices is one of his greatest responsibilities, perhaps he should relinquish his gavel to someone who does. 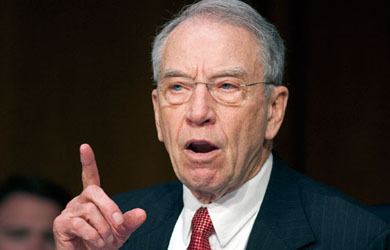 Who Is Chuck Grassley Listening To?